The further education and skills sector has experienced policy changes illustrated by a range of successive Government White Papers. The Post-16 Skills Plan (July 2016) is the Government’s response to the Report of the Independent Panel on Technical Education (April 2016) led by Lord Sainsbury. The Sainsbury report made 34 recommendations which includes the development of a common framework of 15 routes that encompasses all employment-based and college-based technical education at levels 2-5; reform of the current awarding organisation market model, reformed IAG, a wider remit for the Institute of Apprenticeships to include technical education, and a continued focus on maths and English for all learners. The Government has accepted all the recommendations of the Panel. It published an initial timetable of main steps it intends to take from now to 2020. This has significant implications for all providers. 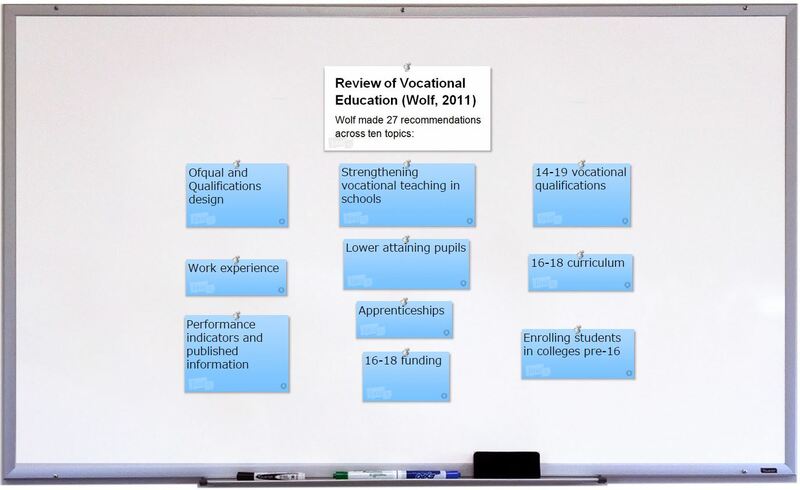 The Review of Vocational Education (Wolf, 2011) made 27 recommendations across ten topics. The Sainsbury Report builds on Wolf’s recommendations. August 2014: Condition of funding attached to learners who have not achieved a grade A*-C GCSE in English and maths to continue to study these, or an approved stepping stone qualification towards GCSE. August 2015: revised condition of funding* so all full-time students starting their study programme who have a grade D GCSE or equivalent in maths and/or English must be enrolled on a GCSE or approved IGCSE qualification in maths and/or English, and not an approved stepping stone qualification. August 2016: a new headline 16-19 English and maths performance table measure which shows the progress of those who did not achieve a C at Key Stage 4. *This revised condition does not apply to students on apprenticeships or traineeships. In 2014 the Coalition Government published its strategy to support workforce development in further education. A wide range of strategies and incentives have been put in place to help schools, colleges and providers develop their workforce to meet the changes outlined above. The current Government continues to fund the FE initial teacher training bursaries (2016-2017) to support the sector to recruit sufficient specialist maths and English teachers. Further teacher recruitment initiatives are managed by the Education and Training Foundation. The Government is working towards implementation. Apprenticeships will be based on employer-designed standards and assessment. These new standards will replace the current frameworks, and will be short, easy to understand descriptions of the skills, knowledge and competence required to achieve mastery of a specific occupation and operate confidently in the sector. Apprentices will demonstrate competence through rigorous independent, and increasingly synoptic assessments based on the new standards. Apprentices will be awarded a pass, merit or distinction, applied to the full apprenticeship standard. All apprenticeships will last at least 12 months, with off-the-job training and English and maths requirements. English and maths will be stepped up gradually, reflecting the importance of these transferable skills. New apprenticeships, starting with those developed by Trailblazers, will have a stronger focus on English and maths. Employers developing standards will be able to specify a higher level of English and/or maths achievement where this is needed for particular occupations or sectors. Currently apprentices can meet the English and maths requirements through Functional Skills or GCSE qualifications.